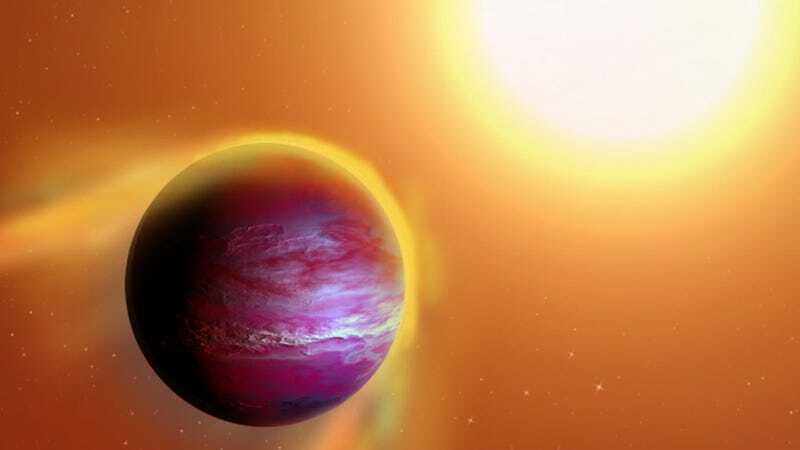 Astronomers have discovered a newly born “hot Jupiter” in a distant star system that’s locked in a slow death spiral. It may only be a matter of time before this poor baby planet gets torn to shreds. Located 1,100 light years away in the constellation of Orion, this star system is just two million years old. That’s a blip in cosmological terms. Just to give you some perspective: Earth is 4.5 billion years old, and the first genus of Homo emerged in Africa about 2.8 million years ago. That means this star is actually younger than the most ancient humans. And one of its planets is already dying. As described in the Astrophysical Journal, this newly born planet—about twice the size of Jupiter—is spinning around its host star at ludicrous speed, requiring just 11 hours to make a complete orbit. As it spins around in this tight orbit, gravity from the host star is pulling away its outer layers. According to the Rice University researchers who led the study, it’s an extreme case of an “evaporating hot Jupiter.” Scientists have observed short orbits before but never in a planet quite so young. In fact, it’s one of the youngest planets ever discovered. To date, astronomers have detected more than 3,300 exoplanets, the majority of them orbiting middle-aged stars like our sun. Earlier this year, astronomers announced the discovery of a massive planet in tight orbit around a star so young it still features a disk of circumstellar gas and dust. This new planet, dubbed PTFO8-8695 b, rivals that in terms of its youth. As for the fate of this new planet, the astronomers can only speculate. Spectroscopic observations revealed that the planet is only about three to four times the size of the star—but its hydrogen emissions are almost as bright as the emission emanating from the star.